July 15, 2015 – Since its discovery in 2005, Pluto’s moon Hydra has been known only as a fuzzy dot of uncertain shape, size, and reflectivity. Imaging obtained during New Horizons’ historic transit of the Pluto-Charon system and transmitted to Earth early this morning has definitively resolved these fundamental properties of Pluto’s outermost moon. Long Range Reconnaissance Imager (LORRI) observations revealed an irregularly shaped body characterized by significant brightness variations over the surface. 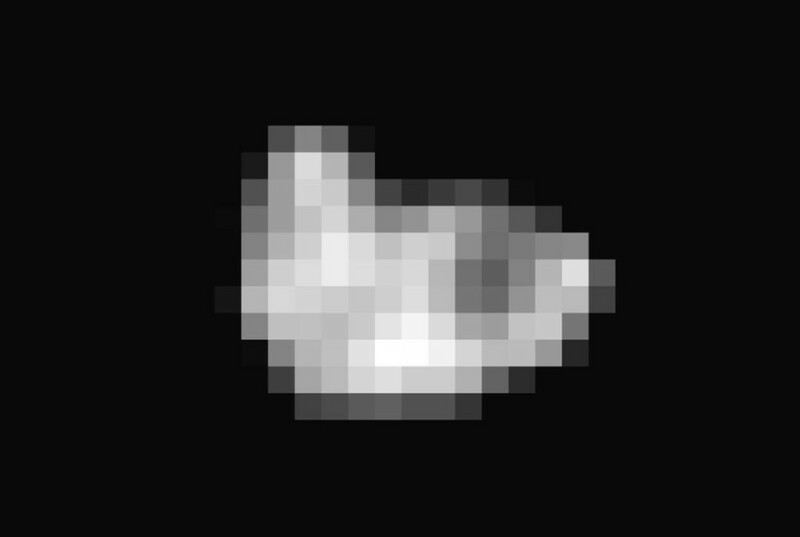 With a resolution of 2 miles (3 kilometers) per pixel, the LORRI image shows the tiny potato-shaped moon measures 27 miles (43 kilometers) by 20 miles (33 kilometers). Like that of Charon, Hydra’s surface is probably covered with water ice, the most abundant ice in the universe. Observed within Hydra’s bright regions is a darker circular structure with a diameter of approximately 6 miles (10 kilometers). Hydra’s reflectivity (the percentage of incident light reflected from the surface) is intermediate between that of Pluto and Charon.